Remember all that evidence showing how Trump colluded with Russia? Remember that long detailed list of all the endless constant lies that Trump tells? Remember when Benghazi was started by a YouTube video? Remember when you liked your doctor, you could keep your doctor? Remember Antifa's support for peaceful protest and respect towards opposing views? Remember all that media coverage of Kate Steinle, Grant Ronnebeck, Jamiel Shaw, Ronald Singh, and the other victims of illegal alien crime? Remember how the media persistently hounded Ralph Northam for his support of post term abortion/murder and racist black face hypocrisy? Remember when Judge Kavanaugh was given the same due process as Justin Fairfax? I don't and it wasn't awesome. Remember when the SJWs and RINOs all said Trump would never be president and Hillary would win in a landslide? Remember when Obama said "stop complaining and accept the results?" Remember when you could browse the web without being bombarded with Christophobic hate speech and other unrelated leftwing fascism getting shoehorned in because of the most remotely arcane algorithms? LOL- still saying those things? I pay a lot of taxes and will be fine. 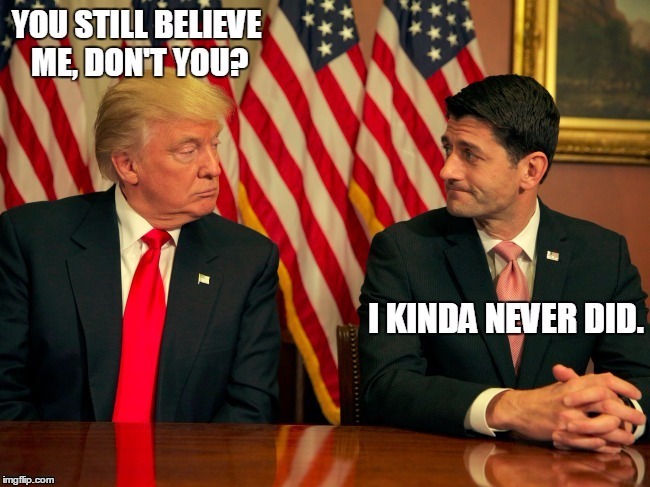 Just curious if Trumps diehards still think he actually will keep his word on anything or simply continue to adjust their expectations to suit his (in)actions. You know after he doesn't do what he said he would they turn around and say "welllll....he didn't REALLY mean that.....he meant______" At some point don;t you have to ask "well....when exactly do you start actually taking what he says at face value?" If liberals turned around and said "welllll....he didn't REALLY mean that.....he meant 'if you like your doctor you can continue to like your doctor but you might get another doctor that you will like too....or not' " All hell would have broken loose. What a load of BS. All you delusional fascists do is project lies and stupidity. He has delivered on EVERYTHING while you've done nothing but destroy, threaten, and assault with your Antifa fascist temper tantrums. Every city and state you control is a stinking ghetto rampant with crime and poverty. You're a spoiled self entitled brat who hires illegals to do the work your lazy hypocrite self won't do. You're the stinking liars. THERE IS NO RUSSIA COLLUSION YOU DELUSIONAL HATE SPEWING EVIL FASCIST. You create poverty and drive away business with rampant taxation while expanding your socialist welfare state. You don't care about the poor or working Middle class America and it's disgusting that you continue to get away with spouting evil rot gut bigotry. Only you masked devils would forcefully take the remains of Korean war vets from their families and send them back to Kim Jong Un out of pure spite against Trump. If I am a bottom feeder I can't imagine what the likes of most of those die hard trumpers are. They seem to have a little less money coming in than I do. No you called me a "scum bag bottom feeder" whcih would indicate (any intelligent person would infer) I am feeding off others.....I can assure you I don't rely on anyone else. My income is indicative of that. And you are an angry, pathetic excuse for a person. I would normally say "Good day, sir" but I don't want you to have one. You don;t deserve it. In fact a stroke would be better for you. If we're subhuman lab specimens promoting misery, than what happened to freedom of speech? What does that have to do with Drumpf not being a disappointment? Why don't you ask fake news reporter Jim Acosta of CNN how much Trump disappointed his followers today? We're too busy high fiving each other over here because DJT schooled that little b**ch in his new conference. And right after Senator Sessions gets confirmed as the new head of DOJ, we'll be doing some more high fives. Does that sound to you retards like we're disappointed over here? 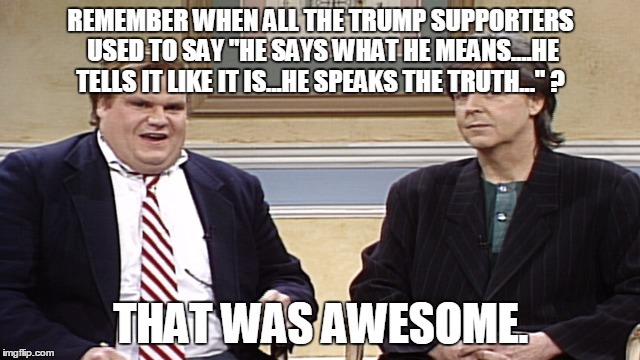 REMEMBER WHEN ALL THE TRUMP SUPPORTERS USED TO SAY "HE SAYS WHAT HE MEANS....HE TELLS IT LIKE IT IS...HE SPEAKS THE TRUTH..." ? THAT WAS AWESOME.